Background: Dendrobium thyrsiflorum is highly vulnerable to extinction in its natural habitats due to overexploitation for the medicinal and horticultural purposes. The poor seed germination in a natural condition and slow plant production through vegetative approach make in vitro micropropagation techniques an ideal choice for effective plant propagation. There are very limited reports on the in vitro culture of this orchid. Objective: The objective of the study is to establish efficient in vitro regeneration protocols for rapid mass propagation of D. thyrsiflorum. Materials and Methods: Five-month-old undehisced capsule was surface sterilized with 0.4% mercuric chloride. To study the influence of growth regulators on in vitro development of shoots and roots, the seeds obtained from the capsule were inoculated on freshly prepared Mitra medium supplemented with different concentrations and combinations of 6-benzylaminopurine (BAP), kinetin (KN), indole -3-butyric acid (IBA), indole-3-acetic acid (IAA), and 1-naphthyl acetic acid (NAA). Results: The KN either singly or with IAA produced more effective shooting than BAP at similar concentration and combination. Maximum shoot production (3.83 ± 0.48) was achieved in medium fortified with 1.0 mg/L KN and 2.5 mg/L IAA. IAA was the most influential among auxins tested in promoting rooting and shooting. Prominent shoot development (3.04 ± 0.73) and maximum root formation (6.52 ± 0.37) were noticed in medium supplemented with 2.0 mg/L IAA. The regenerated plantlets were subsequently hardened with 91% survival rate in greenhouse and field condition. Conclusion: The present investigation revealed the possibility of developing effective and reproducible in vitro regeneration protocols for rapid propagation of D. thyrsiflorum. The established in vitro protocols can be employed for fast regeneration of the orchid for useful phytochemical extraction without depending on the already depleted natural population. Abbreviations used: BAP: 6-benzylaminopurine; KN: Kinetin; IBA: Indole-3-butyric acid; IAA: Indole-3-acetic acid; NAA: 1-naphthyl acetic acid; MT: Mitra medium. Kinetin was found to more effective in inducing shooting than 6-benzylaminopurine. The in vitro regenerated Dendrobium thyrsiflorum plantlets were successfully hardened with 91% survival rate in greenhouse and field condition. There is a sharp decline in the population of D. thyrsiflorum due to habitat destruction, widespread indiscriminate collection, and overexploitation because of its extensive applications in the field of medicine and horticulture. The orchid is presently listed in Red Data Book of International Union for Conservation of Nature. Furthermore, the whole of Orchidaceae family is included in Appendix II of Convention on International Trade in Endangered Species of Wild Fauna and Flora. Devising an effective conservation strategy is highly essential to not only save the endangered orchid from the brink of extinction but also harness its wide range of economic potentials. As typical vegetative propagation methods are time-consuming and commercially not viable, in vitro conservation through plant tissue culture can provide an excellent opportunity for large-scale propagation of orchid without sacrificing rare mother plants. This approach will also overcome the limitation of low seed germination of minute and nonendospermous seeds in nature due to the requirement of mycorrhizal fungi association. Mass propagation through the adoption of micropropagation techniques could minimize the extreme collection pressure imposed on natural populations of D. thyrsiflorum. The reports on in vitro propagation of D. thyrsiflorum are scanty, and in vitro culture approach has not been fully exploited for its conservation. The study was conducted with an aim to mass propagate this endangered medicinal orchid by establishing effective, reliable, and reproducible in vitro regeneration protocols. The mature undehisced capsules of about 5months old were collected from the naturally pollinated D. thyrsiflorum orchids grown in the Khonghampat Orchidarium, Manipur, India. The capsules were stored at 4°C until they were used for initiating culture after proper surface sterilization. The sterilization was performed by first washing the capsule thoroughly with running tap water for 5–10 min to remove any dust and soil particles adhered to it. The capsule was subjected to the treatment with 0.4% mercuric chloride for 6–7 min after being washed with 10% Tween 20 for 10 min. The capsule after washing 4–5 times with sterile ultrapure water was flamed sterilized for 3–5 s by dipping in absolute alcohol for 2–3 s.
The surface sterilized capsule was split opened longitudinally to expose the numerous minute seeds using sterile spatula inside the ultraviolet preilluminated laminar hood. The light exalbuminous seeds obtained from the capsule were inoculated using sterile forceps into sterilized culture tubes (Borosil, 32 mm × 200 mm) containing 40 ml of basal Mitra medium (MT). The medium was supplemented with 3% sucrose (HiMedia, Mumbai) as carbohydrate source and volume makeup were done with double distilled water and the pH adjusted between 5.5 and 5.8 using 1N NaOH and HCl. The medium was incorporated with 0.9% agar (HiMedia, Mumbai) as gelling agent. The boiled media were dispensed in culture tubes, with or without plant growth regulators, and made airtight using aluminum foil. The media-laden culture tubes were finally autoclaved at 121°C for 15 min and were finally allowed to gel in the slanting position. All cultures, after the inoculation of seeds, were maintained at 25°C ± 2°C with proper light illumination at 60 μmol/m2/s for 16/8 h a day using white fluorescent tubes. To study the influence of growth regulators on in vitro culture development, 6-benzylaminopurine (BAP), kinetin (KN), indole-3-butyric acid (IBA), indole-3-acetic acid (IAA), and 1-naphthyl acetic acid (NAA) were supplemented either individually or in combinations at different concentrations. The culture vessels were made airtight using aluminum foil after dispensation of definite quantities of growth hormone-laden culture media. The media with different hormonal combinations were finally autoclaved at 121°C for 15 min and were finally allowed to gel in the slanting position. The cultures after inoculation of Dendrobium orchid seeds were maintained at 25°C ± 2°C with proper light illumination at 60 μmol/m/s for 16/8 h a day using white fluorescent tubes. The in vitro-raised seedlings with well-developed shoots and roots were transferred to full strength culture MT devoid of any plant growth regulators for 3–4 weeks. The plantlets were further transferred to half strength MT medium without any sucrose and vitamins and kept for another 3–4 weeks before they were taken out from the culture vessels using sterile forceps. The plantlets were washed with tepid water to remove agar and treated with 0.01% fungicide solution (Sixer, Dhanuka Agritech Ltd., Gujarat, India) for 10–15 min to get rid of fungal contaminants in the seedlings, if any. The plants were then transplanted to perforated small plastic pots containing brick and charcoal pieces along with coconut husk (1:1:1) as potting mixture. The transplanted plants were sprayed with liquid MT medium incorporated with 1 ml/L dhanzyme gold, an organic extract from seaweed (Dhanuka Agritech Limited, Gujarat, India). The potted plantlets were initially kept 3–4 weeks inside the glass house for further acclimatization and finally exposed to normal daylight in greenhouse. The experiments were conducted thrice using ten replicates per treatment. The first subculture was performed in 10 weeks followed by consecutive subculture to freshly prepared medium for every 4 weeks. The culture responses with regard to the development of shoots and roots were recorded at the regular intervals. The data were subjected to analysis of variance, and the significant differences were determined by employing Duncan's multiple range test at P = 0.05. The statistical data analysis was performed using SPSS software program (SPSS Inc., Chicago, IL, USA). The seeds started swelling at 2–3 weeks of culture indicating successful initiation of seed germination [Figure 1]a. This was followed by rupturing of testa and formation of spherical-shaped chlorophyllous and protocorms in 5 and 7 weeks, respectively [Figure 1]b. 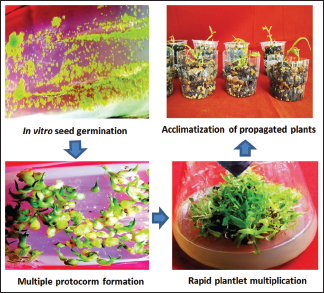 Subsequent development after protocorm stage resulted in apical shoot meristem and leaf primordia formation [Figure 1]c and [Figure 1]d. Further growth led to successful in vitro generation of seedlings with leaves and roots. Multiple shoot induction was observed in either BAP or KN-supplemented medium [Figure 2]a. Elevating the concentration of BAP or KN from 0.5 mg/L to 2.0 mg/L gave more shoots and longer shoots length [Table 1]. However, KN at 2.0 mg/L was more effective in inducing multiple shooting (3.16 ± 0.47) [Figure 2]b as compared to BAP generating lesser shoot number (2.18 ± 0.54) at a similar concentration. Production of greater shoot number and longer shoots was also witnessed with increased concentration of individual auxins (IAA, IBA, and NAA) from 0.5 mg/L to 2.0 mg/L. The presence of 2.0 mg/L IAA in medium promoted vigorous root formation with maximum rooting response (6.52 ± 0.37) witnessed in culture [Figure 2]c. While favorable root formation was also evidenced with IBA supplemented medium, NAA seemed to be the least influential among the auxins in inducing rooting. The combined effects of cytokinin (BAP or KN) and auxins (IAA, IBA, or NAA) at a similar concentration (1.0 mg/L) were tested to determine best in vitro shoot and root development response [Table 2]. 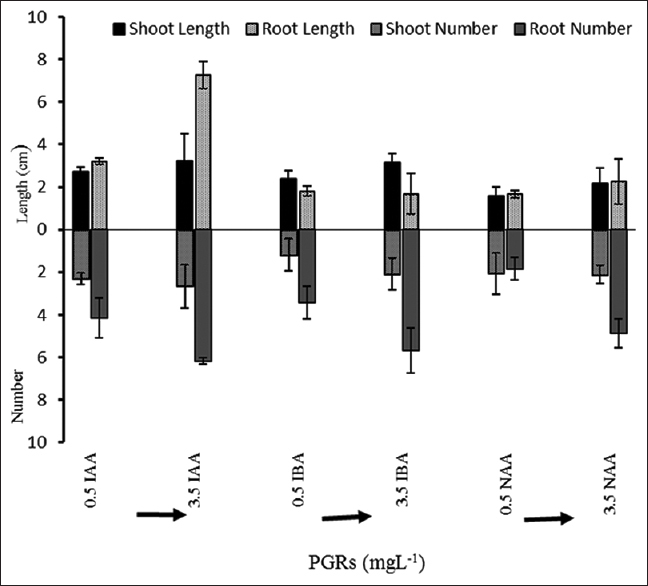 Maximum shoot number (3.49 ± 0.96), shoot length (2.45 ± 0.29 cm), root number (4.85 ± 0.75), and root length (2.81 ± 0.15 cm) were recorded in MT + 1.0 mg/L KN + 1.0 mg/L IAA. The shoot production was also prominent in MT + 1.0 mg/L KN + 1.0 mg/L IBA and MT + 1.0 mg/L KN + 1.0 mg/L NAA with the formation of 2.78 ± 0.92 and 2.44 ± 0.72 shoots, respectively. Cultures responded effectively to MT + 1.0 mg/L KN + 1.0 mg/L IBA and MT + 1.0 mg/L KN + 1.0 mg/L NAA for root formation yielding 2.59 ± 0.87 and 3.16 ± 0.24 roots, respectively [Table 2]. The combination of BAP and NAA exhibited least response to shoot (1.92 ± 0.85) and root (1.01 ± 0.48) formation, followed by the association of 1.0 mg/L BAP and 1.0 mg/L IBA producing 2.16 ± 0.84 shoots and 0.79 ± 0.32 roots, respectively. KN proved to be more effective than BAP in inducing multiple shoots and root formation when associated with IAA, IBA, or NAA at a similar concentration. A parallel study was conducted after third passage (18 weeks of culture) to determine the effects of auxins on shoot and root development in seedlings by transferring ten seedlings each from the initial culture condition to freshly prepared media containing new hormone combinations. A comparative study was conducted on shoot and root development in seedlings grown in the initial plant growth hormone combinations and new combinations. Incorporation of higher auxin concentration of 3.5 mg/L IAA and 4.0 mg/L IAA to initial 0.5 mg/L BAP and 2.0 mg/L BAP, respectively, produced less number of shoots and roots [Figure 3]. However, the new combination of MT + 0.5 mg/L KN + 3.5 mg/L IAA showed better multiplication of shoots (2.50 ± 0.54) and roots (2.82 ± 0.19) than initial medium-enriched only with 0.5 mg/L KN [Figure 3]. Addition of higher concentration of IAA (4.0 mg/L) to the earlier medium with 2.0 mg/L of KN generated higher shoot number (3.31 ± 0.81) though shoot length (1.34 ± 0.26 cm) and root formation (1.98 ± 0.73) was diminished prominently. 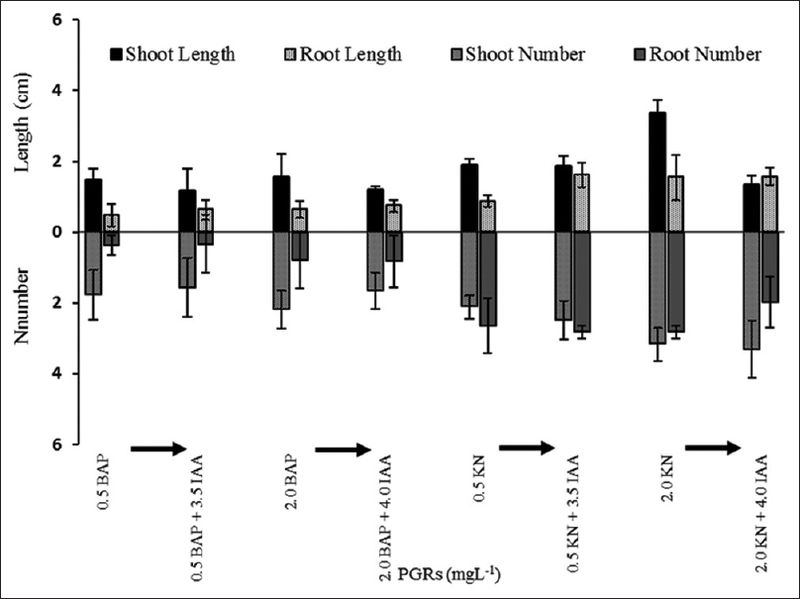 When the auxin concentration was increased from the initial 1.0 mg/L to 2.5 mg/L in new combinations, there was notable reduction in shoot formation though root development was slightly improved. While initial hormonal combinations of MT + 1.0 mg/L BAP + 1.0 mg/L IAA, MT + 1.0 mg/L BAP + 1.0 mg/L IBA, and MT + 1.0 mg/L BAP + 1.0 mg/L NAA recorded 2.18 ± 0.36, 2.16 ± 0.84, and 1.92 ± 0.85 number of shoots, respectively, the new combinations with higher auxin concentration of MT + 1.0 mg/L BAP + 2.5 mg/L IAA, MT + 1.0 mg/L BAP + 2.5 mg/L IBA, and MT + 1.0 mg/L BAP + 2.5 mg/L NAA produced reduced shoot number of 1.23 ± 0.51, 0.83 ± 0.75, and 0.78 ± 0.43, respectively [Table 3]. Except for 2.5 mg/L NAA which showed lesser roots (2.50 ± 1.04) with 1.0 mg/L KN, higher root development was witnessed when KN at 1.0 mg/L was associated with 2.5 mg/L of IAA or IBA. Elevated level auxins (IAA, IBA, and NAA) from 0.5 mg/L to 3.5 mg/L gave profound impact on in vitro shoot and root development of the culture. Improvement in shoot formation was evident in MT + 3.5 mg/L IAA, MT + 3.5 mg/L IBA, and MT + 3.5 mg/L NAA with the production of 2.66 ± 1.03, 2.08 ± 0.75, and 2.12 ± 0.41 shoots, respectively [Figure 4]. The rooting response was more intense in new culture conditions as compared to initial combinations with lower auxin concentration. Substantial increase in root formation was noticed in MT + 3.5 mg/L IAA, MT + 3.5 mg/L IBA, and MT + 3.5 mg/L NAA yielding 6.17 ± 0.14, 5.66 ± 2.06, and 4.86 ± 0.68 roots, respectively [Figure 4]. The well-grown seedlings were finally acclimatized in greenhouse condition using brick pieces, charcoal pieces, and coconut husk (1:1:1) as potting mixture with survival rate of 91% after 16 weeks of hardening [Figure 2]d.
A symbiotic seed germination had been employed as suitable propagation technique to increase population size of many declining orchid species mainly due to their slow and low seed germination rate in nature.,, The numerous nonendospermous orchid seeds need specific nutrition under certain environmental conditions as they possess very limited food reserves. The medium comprising inorganic and organic constituents, additives, and exogenous plant hormones furnishes the essential nutrients for the germinating seeds under in vitro condition. The same was found true for exalbuminous seeds of D. thyrsiflorum when they were grown on nutrient medium. KN influenced in vitro shoot proliferation by inducing quick cell division to form numerous shoots in Dendrobium huoshanense. Similarly, incorporation of KN in medium enhanced shoot formation in D. thyrsiflorum indicating the significance of exogenous cytokinin in promoting multiple shooting. In the present investigation, maximum shoot formation was reported on medium enriched with 2 mg/L KN. The longest shoot length (3.36 ± 0.37 cm) was also recorded in the same hormone combination defying the general observation that shoot length was always shorter in culture with higher shoot numbers. This is because all the available nutrients might have been utilized in the formation of multiple shoots. Srivastava et al. earlier reported the formation of highest shoot number and longest root length in Aerides ringens when grown on KN-enriched medium. Asghar et al. also encountered longest shoot formation in Dendrobium nobile on medium fortified with 1.5 mg/L KN. The present study showed BAP to be less effective as compared to KN in initiating in vitro shooting response. This result was in agreement with the earlier reports of inhibitory response of BAP on the shoot development in D. nobile, Dendrobium aqueum, and Doritis pulcherrima.,, The combination of BAP with IAA, IBA, or NAA at different concentrations proved less favorable in comparison to KN with similar auxin combinations. The more effectiveness of KN over BAP in producing better shoots and roots when combined with other auxins have also been previously demonstrated. The presence of IAA at 2.0 mg/L generated higher shooting response than cytokinins (BAP and KN) at different concentrations. Similar observations of higher shoot production under the influence of auxins were earlier reported in Dendrobium pendulum, Dendrobium primulinum, Dendrobium heterocarpum, D. aqueum, Dendrobium microbulbon, and Dendrobium chrysanthum.,,, The effect of auxin in promoting in vitro rooting in plant was well studied. The present research also revealed the promontory effect of auxins in rooting development in the culture. The maximum root formation was recorded in IAA-supplemented medium in 30 weeks. Similarly, the highest root formation in IAA augmented medium was earlier noted for D. primulinum and Dendrobium aggregatum., Increase in concentration of IAA from 0.5 mg/L to 3.5 mg/L after the third passage remarkably improved root formation. Enhancement in root development was also observed with a higher concentration of IBA at 2.0 mg/L (4.93 ± 0.82) and 3.5 mg/L (5.66 ± 2.06). Bhattacharyya et al. also recorded high root formation (5.5 ± 0.5) in D. thyrsiflorum when medium was fortified with 2.0 mg/L of IBA. Similar observation of higher root multiplication was encountered with increased auxin concentration in culture medium in A. ringens and Alcantarea odorata., Of the three auxins (IAA, IBA, and NAA) tested at different concentrations in the present study, NAA was found to be least effective in inducing rooting. Lesser influence of NAA in in vitro rooting induction was also observed in Cymbidium masterii. Root formation though usually occurs with most of the auxins in plants, IAA and IBA are especially the most effective in many orchids.,,, Incorporation of higher auxin (IAA) concentration into the initial cytokinin-containing medium did not prove favorable for shoot and root development as root and shoot number reduced prominently. Similarly, higher concentration of auxins in the presence of cytokinin exhibited poor shooting and rooting response in D. nobile. The results from the present study demonstrated the effectiveness of KN and IAA in promoting in vitro shoot and root development in culture of D. thyrsiflorum. KN proved to be more efficient than BAP in inducing shooting while IAA was the most influential among the auxins tested for vigorous root formation. The rapid plant propagation with high survival rate posthardening process revealed the prospect of utilizing the established in vitro protocols for large-scale production of plant materials. The in vitro propagated medicinal orchid may be utilized for the preparation of phytomedicines and floricultural-related applications without further exploiting its fast diminishing natural populations. The present investigation revealed the possibility of developing effective and reproducible in vitro regeneration protocols for rapid propagation of D. thyrsiflorum. The established in vitro protocols can be employed for fast regeneration of the orchid for useful phytochemical extraction without depending on the already depleted natural population. The authors are thankful to University Grant Commission, New Delhi, India, for the financial support. Chowdhery HJ, editor. Orchid Flora of Arunachal Pradesh. India: Bishen Singh Mahendra Pal Singh, Dehradun; 1998. Yan Z, Luoshan X, Zhengtao W, Chaoying Z. Variation in coumarin accumulation by stem age in Dendrobium thyrsiflorum (Orchidaceae) at different developmental stages. Afr J Biotechnol 2009;8:794-800. Zhang SY, Meng L, Gao WY, Song NN, Jia W, Duan HQ, et al. Advances on biological activities of coumarins. Zhongguo Zhong Yao Za Zhi 2005;30:410-4. Song N, Lu Y, Qiu MH. Studies on immunomodulation of polysaccharide from Dendrobium thyrsiflorum (Reichb. f.). Nat Prod Res Dev 2006;3:23-9. Wrigley TC. Ayapin, scopoletin and 6,7-dimethoxycoumarin from Dendrobium thyrsiflorum (Reichb. F.). Nature 1960;188:1108. Xing YM, Chen J, Cui JL, Chen XM, Guo SX. Antimicrobial activity and biodiversity of endophytic fungi in Dendrobium devonianum and Dendrobium thyrsiflorum from Vietman. Curr Microbiol 2011;62:1218-24. Baute MA, Deffieux G, Baute R, Neveu A. New antibiotics from the fungus Epicoccum nigrum. I. Fermentation, isolation and antibacterial properties. J Antibiot (Tokyo) 1978;31:1099-101. Zhang Y, Liu S, Che Y, Liu X. Epicoccins A-D, epipolythiodioxopiperazines from a Cordyceps-colonizing isolate of Epicoccum nigrum. J Nat Prod 2007;70:1522-5. Senthikumar S. Problems and prospects of orchid mycorrhizal research. J Orchid Soc India 2001;15:23-32. Wochok ZS. The role of tissue culture in preserving threatened and endangered plant species. Biol Conserv 1981;20:83-9. Zhang L, Chen J, Lv Y, Gao C, Guo S. Mycena sp., a mycorrhizal fungus of the orchid Dendrobium officinale. Mycol Prog 2012;11:395-401. Mitra GC. In vitro culture of orchid seeds for obtaining seedlings. In: Vij SP, editor. Biology, Conservation, and Culture of Orchids. New Delhi: Affiliated East-West Press Private Ltd.; 1986. Devi CG, Damayanti M, Sharma GJ. Aseptic embryo culture of Vanda coerulea Grief. J Orchid Soc India 1998;12:83-7. Stewart SL, Kane ME. Asymbiotic seed germination and in vitro seedling development of Habenaria macroceratitis (Orchidaceae), a rare Florida terrestrial orchid. Plant Cell Tiss Org Cult 2006;86:147-58. Thomas TD, Michael A. 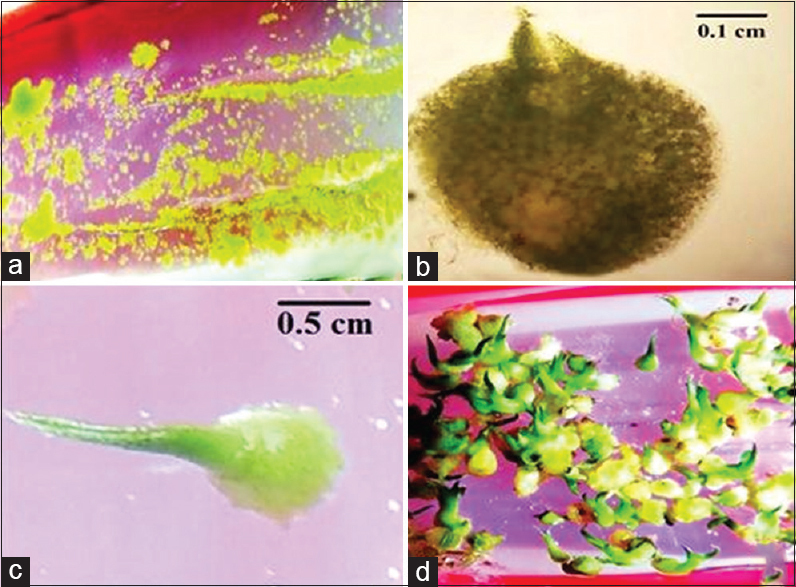 High frequency plantlet regeneration and multiple shoot formation from cultured immature seeds of Rhynchostylis retusa Blume, an exquisite orchid. Plant Biotech Rep 2007;1:243-9. Arditti J, Ernst R, Yam TW, Glabe C. The contribution of orchid mycorrhizal fungi to seed germination: A speculative review. Lindleyana 1990;5:249-55. Luo JP, Wawrosch C, Kopp B. Enhanced micropropagation of Dendrobium huoshanense C.Z. Tang et S.J. Cheng through protocorm-like bodies: The effects of cytokinins, carbohydrate sources and cold pretreatment. Sci Hortic 2009;123:258-62. Yakimova E, Toteva VK, Groshkoff I, Ivanova G. Effect of BA and CPPU on protease and α-amylase activity of in vitro cultured explants of Rosa hybrida L. Bulg J Plant Physiol 2000;26:39-47. Srivastava D, Gayatri MC, Sarangi SK. In vitro seed germination and plant regeneration of an epiphytic orchid Aerides ringens (Lindl.) Fischer. Indian J Biotech 2015;14:574-80. 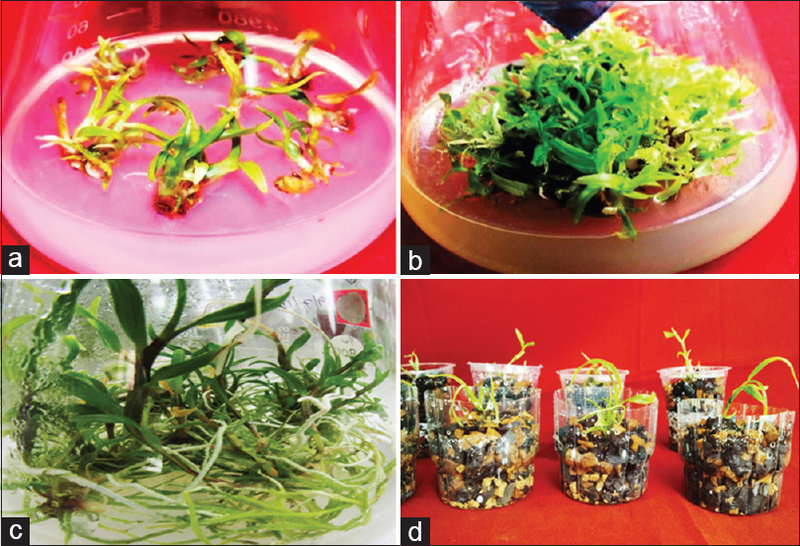 Asghar S, Ahmad T, Hafiz IA, Yaseen M. In vitro propagation of orchid (Dendrobium nobile) var. Emma White. Afr J Biotech 2011;10:3097-103. Nayak NR, Sahoo S, Patnaik S, Rath SP. Establishment of thin cross section (TCS) culture method for rapid micropropagation of Cymbidium aloifolium (L.) Sw. and Dendrobium nobile Lindl. (Orchidaceae). Sci Hortic 2002;94:107-16. Parthibhan S, Franklin BJ, Muthukumar M, Sherif NA, Senthil Kumar T, Rao MV. Influence of nutritional media and photoperiods on in vitro asymbiotic seed germination and seedling development of Dendrobium aqueum Lindley. Afr J Plant Sci 2012;6:383-93. Mondal T, Aditya S, Banerjee N. In vitro axillary shoot regeneration and direct protocorm-like body induction from axenic shoot tips of Doritis pulcherrima Lindl. Plant Tissue Cult Biotech 2013;23:251-61. Nongdam P, Tikendra L. Establishment of an efficientg in vitro regeneration protocol for rapid and mass propagation of Dendrobium chrysotoxum lindl. using seed culture. ScientificWorldJournal 2014;2014:740150. Li Y, Zhu DH, Pan HT, Zhang QX. In vitro propagation of thrParthibhan S, Senthil Kumar T, Rao MV. Phenology and reintroduction strategies for Dendrobium aqueum Lindley – An endemic, near threatened orchid. J Nat Conserv 2015;24:68-71. Parthibhan S, Senthil Kumar T, Rao MV. Phenology and reintroduction strategies for Dendrobium aqueum Lindley – An endemic, near threatened orchid. J Nat Conserv 2015;24:68-71. Sharma U, Rama R, Mohan J, Reddy A. In vitro propagation of Dendrobium microbulbon A. Rich – A rare ethno medicinal herb. Indian J Biotechnol 2007;6:381-4. Rao S, Barman B. In vitro micropropagation of Dendrobium chrysanthum Wall. ex Lindl. – A threatened orchid. Sch Acad J Biosci 2014;2:39-42. Aloni R, Aloni E, Langhans M, Ullrich CI. Role of auxin in regulating arabidopsis flower development. Planta 2006;223:315-28. Pant B, Thapa D. In vitro mass propagation of an epiphytic orchid Dendrobium primulinum Lindl. Through shoot tip culture. Afr J Biotechnol 2012;11:9970-4. Hossain MM. In vitro embryo morphogenesis and micropropagation of Dendrobium aggregatum Roxb. Plant Tiss Cult Biotechnol 2013;23:241-9. Bhattacharyya P, Kumaria S, Job N, Tandon P. Phyto-molecular profiling and assessment of antioxidant activity within micropropagated plants of Dendrobium thyrsiflorum: A threatened, medicinal orchid. Plant Cell Tiss Org Cult 2015;122:535-50. Pant B, Gurung R. In vitro seed germination and seedling development in Aerides odorata Lour. J Orchid Soc India 2005;19:51-5. Mohanty P, Paul S, Das MC, Kumaria S, Tandon P. A simple and efficient protocol for the mass propagation of Cymbidium mastersii: An ornamental orchid of Northeast India. AoB Plants 2012;2012:pls023. Malabadi RB, Mulgund GS, Nataraja K. Efficient regeneration of Vanda coerulea, an endangered orchid using thidiazuron. Plant Cell Tissu Org Cult 2004;76:289-93. Panwar D, Kheta Ram H, Shekhawat NS. In vitro propagation of Eulophia nuda Lindl., an endangered orchid. Sci Hortic 2012;139:46-52. Nongdam P, Nirmala C. In vitro rapid propagation of Cymbidium aloifolium (L) Sw: A medicinally important orchid via seed culture. J Biol Sci 2011;11:254-60. Nongdam P, Nirmala C. In vitro seed germination and mass propagation of Cymbidium dayanum Reichb: An important ornamental orchid of North-East India. Trends Hort Res 2012;2:28-37.